Today I am the guest artist on the Altered Pages blog! Silk fabric art and more for sale in my CraftFoxes shop! I'm cleaning out my studio and selling several of my art panels and craft projects in my online shop at CraftFoxes.com - check it out! I enjoy looking at my work, but it's time for someone else to enjoy it...then I'll have room to create more! This art panel is called "Silk Sunset" - imagine the sun setting and cracking the ocean like glass. It's a mixed media piece with silk, printed Lutradur, acrylic ink and pouring medium, and silk roving. I'm uploading a variety of work to my CraftFoxes shop little by little, and everything is priced to move - enjoy! This was a fun little bookmark to make with my die-cutting machine. The paper went through with a pinstripe texture plate first, then I used a bird die to emboss and deboss a repeat pattern across the bookmark. I rubbed some pastel pigment over the top to highlight the texture, spritzed it with a little pastel fixative, colored in a few birds with a marker, then glued some die-cut birds on top in a contrasting blue. After punching a few holes around the birds, I glued the embossed green paper on top of a sheet of the blue, so the blue peeks out through the holes, plus the double layer gives the bookmark more rigidity. This month, our group's theme for our artist trading card swap was paint. Last month, we played with paint-stamping using household objects like corks, cookie cutters, wadded up paper, carpet pads, pencil erasers, etc. It was a fun experiment with surface design - I used the large sheet that I stamped to crop into ATCs for this month. The little purple star blings are sitting on top of vintage bingo markers. If you're in the Concord, CA area, click here to join our ATC Meetup group! Our friends at BurlapFabric.com have sponsored a blog hop for the Designer Crafts Connection - are you ready for some creative burlap crafts? Duct tape and gaffer tape are the perfect partners to make a quick and easy bracelet. I’ve always wanted a ladder rack to hang my large-size art papers so I can see what I have. Flat files are fine, but a tall ladder rack filled with gorgeous colors and textures in so much nicer! I just wanted a single rack to prop up against the wall behind my heavy wire drawer cabinets. With the help of a good friend and a power drill, I was able to design my own and sponge-paint it with Americana Décor Chalky Finish Paints. The flat finish of the paint looks really great with the texture of a sea sponge applicator. Click here for my complete project instructions on FaveCrafts. I also posted a review of the paints here...enjoy! It's First Monday - time for a new blog hop for the Designer Crafts Connection! Look for the DCC logo on the sidebar to hop through each designer's blog. This month's theme is party decorations - I made a flower charger plate to bedeck the dip! Every fancy dip needs a fancy presentation on the coffee table. This charger plate was quick to make, and the flower petals are made of a plastic material that you can easily wipe clean if your guests are a bit drippy with the dippy. Paint an 8" Smoothfoam disc in whatever color you like - I chose black to blend in with my black table. Trim 3 sizes of petal shapes from two colors of Rowlux Illusion Film. Fold the large and small petals in half lengthwise and leave the medium petals flat. Cut v-shaped slots around the outside edge of the Smoothfoam disc with a craft knife and insert the tips of large petals with a dab of glue. Use straight pins to alternate and secure the medium and small petals around the top of the disc. Use two pins per petal so they don't shift or spin. You can pin a circle of yellow to the center and glue a ribbon loop on the back so you can hang it on the wall when not in use - it looks pretty in the kitchen. You could also use smaller leaves or petals to make a pretty flower charger plate for everyone at your dining table - in colors to match any holiday or season. Party on! 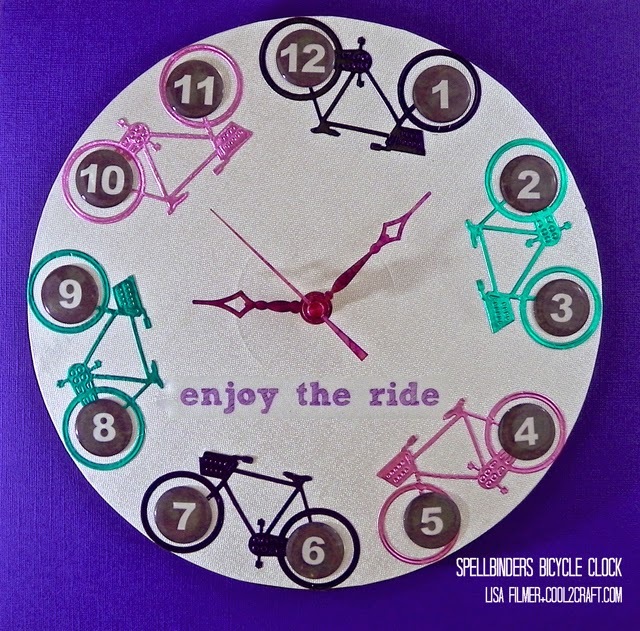 Here's a cute clock I made recently for the Cool2Craft blog, using my one of my favorite dies from the Spellbinders In'Spire line. Click here for my video tutorial with complete instructions. A linked brand name in my posts usually means that I've received free product and/or compensation from that brand. @ Lisa M. Fulmer. Simple theme. Powered by Blogger.